The Samsung Galaxy S10 5G with its menacing quad-rear camera setup has been deemed by DxOMark to be the joint best camera smartphone in the world, alongside the Huawei P30 Pro. 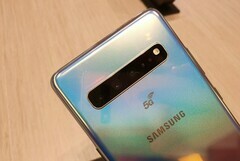 In fact, the S10 5G is top dog in both the video and selfie categories but loses out in the still photography section due to the P30 Pro's outrageous zoom abilities. Well, that didn't take long at all. Just last month, the Huawei P30 Pro took center stage as it became the best camera smartphone in the world by DxOMark's standards, with the phone's impressive zoom and bokeh giving it an edge over the competition. Samsung has responded in excellent fashion, though, and the new S10 5G is now tied with the P30 Pro at the top of DxOMark's leaderboards. The S10 5G earned an overall score of 112, making it the joint top smartphone. It's also a slight improvement from the S10+'s score of 109. In the still photography department, it made do with a score of 117. The P30 Pro scored 119 in this segment, so it has a slight edge. The P30 Pro still has a heavy advantage in the zoom category, but the S10 5G matches it in bokeh. In fact, the S10 5G now has the second-best zoom score (74), beating both the Mate 20 Pro (70) and P20 Pro (73). In the video department, the S10 5G earned a score of 100, better than the P30 Pro, Mate 20 Pro, and the S10+. The Xiaomi Mi 9 is actually now the second-best in that category with a score of 99. In the selfie test, the S10 5G scored 97, which makes it the best selfie smartphone in the world.